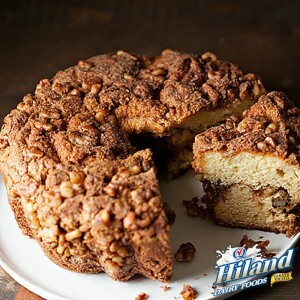 Today is National Coffee Cake Day. How can you turn down the chance to enjoy your daily cup of java with this sweet treat? We’ve got the BEST coffee cake recipe to share with you on this special day…Coffee Pound Cake. This rich, decadent and oh-so-buttery recipe combines the classic coffee cake with the classic pound cake. It’s truly the best of both worlds! First, prepare the Pecan Streusel: Combine brown sugar, flour and cinnamon in a bowl. Cut in butter with a pastry blender or fork. Stir in 3/4 cup pecans. Next, prepare the Pound Cake Batter: Preheat oven to 350°F. Bake 1 cup pecans in a single layer in a shallow pan 5-7 minutes (or until lightly toasted and fragrant), stirring halfway through. Let toasted pecans cool 20 minutes. Reduce oven temperature to 325°F. Beat butter with mixer at medium speed until creamy. Gradually add granulated sugar, beating until light and fluffy. Add eggs (1 at a time), beating just until blended after each addition. Combine flour and baking soda. Alternate adding flour mixture and sour cream to the butter mixture, beginning and ending with flour mixture. Beat at low speed just until blended after each addition. Stir in vanilla. Pour half of the batter into a greased and floured 10-inch tube pan. Stir together toasted pecans, brown sugar and cinnamon; sprinkle over batter. Spoon remaining batter over pecan mixture; sprinkle with the prepared Pecan Streusel. Bake at 325° for 1 hour and 20 minutes to 1 hour and 30 minutes, or until a long wooden pick inserted in center comes out clean. Cool in pan on a wire rack 10-15 minutes; remove from pan and place directly on wire rack to cool completely (about 1 hour).